Expensive activities are stressful for me because paying for them weighs on my mind. I enjoy cheap or free pastimes, and even some pastimes that make money. 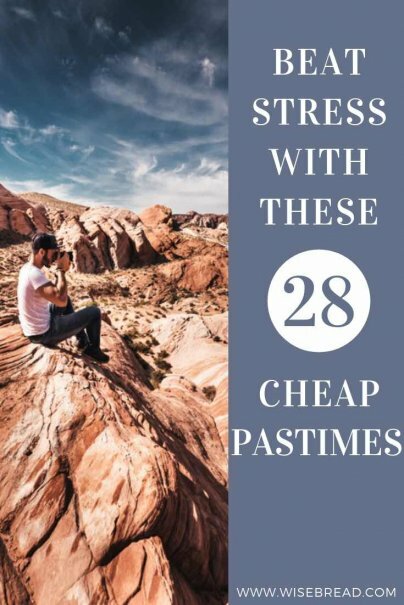 Here are some inexpensive pastimes that you can enjoy to stay blissfully preoccupied without spending much money. The payoffs for regular exercise are immense, not least is the relaxation. Bicycling can be a very inexpensive hobby. I picked up a cheap used bike for $28, rode it for five years, and then sold it for $35! In addition to a bike, there are a few other things you’ll need to get started: a bike helmet and a bike lock to keep yourself and your bike safe. If you buy an older bike, you may need to change the tires and inner tubes, but you can do this yourself for only a few dollars. A cheap bike provides transportation, exercise, and entertainment. Even if you don’t have any money at all, you can still enjoy walking. Walking is a convenient way to spend time outside and enjoy the seasons with no special equipment or planning required. When the weather is bad, I enjoy walking indoors in shopping malls. Sometimes I like to go to go hiking in a park or trail away from roads and sidewalks. Hiking takes a bit more effort than simply going for a walk near your home or workplace, but provides more opportunities to get close to nature. Most hiking trips are free, but I recently paid $10 to go for a five-hour hike among the redwoods in Muir Woods National Monument while visiting San Francisco. This was the most entertainment I have ever gotten for $10! After you've worked your muscles, challenge your noodle. Reading can be free if you get books at a public library or find free classics to read on your electronic devices via sites such as Project Gutenberg. It seems like there is a nearly endless supply of new books coming along, plus the old classics to catch up on. Writing has been a great pastime for me. It is exciting to see my work published, and I have even been able to make some money along the way from writing books, articles, and through advertising on my blog. If you are not ready to publish your work for the world to see, writing a journal for yourself or stories to share with your friends and family is a great way to get started writing. Crossword puzzles help keep your mind sharp and some people seem to really enjoy doing them. I have tried doing crossword puzzles a few times, but it is too much like doing a homework assignment for me to enjoy. Maybe I need to find some easier crossword puzzles to build up my skills. I have tried brain games on my computer, such as the free trial version of Lumosity, and I sometimes play Math Blaster on my Android device. There are all kinds of free brain games that exercise your skills and help you stay sharp as you try to beat your high score. Some games even allow you to compare your scores with others. You no longer need to wait until Sunday evening for NOVA to come on PBS. You can get a wide selection of educational programs any time on Netflix ($8 per month) or YouTube (free). I like to find TED Talks on YouTube to find interesting perspectives on everything from physics to social sciences. Some people get excited about doing jigsaw puzzles and like to receive them as gifts. Jigsaw puzzles can provide many hours of entertainment for not much money, and you do get a sense of satisfaction — or relief — when the puzzle is complete. You can pick up used jigsaw puzzles at garage sales for a dollar or two that provide hours of entertainment, but you might find out that there are missing pieces. You can make a serious hobby out of researching your ancestry. It is easier than ever to research family history and find links to your family’s past. You can get a long way without spending much money and produce research on your family history that will be invaluable to future generations. When you learn a foreign language, you learn more than just a bunch of foreign words. You learn about another culture and open up opportunities to meet and learn about new people. When you tire of puzzles and brain games, re-connect with nature. Camping can be a great way to get away and see things from a fresh perspective. You can find places to camp for free, but even if you pay to stay in a campground, you can find places to pitch a tent for around $20 per night. Basic fishing equipment doesn’t cost a lot of money. You can get an inexpensive rod and reel good enough to catch your dinner for around $25. I still have a lot of the same fishing tackle I used when I was growing up. The price of a seasonal fishing license varies by location. I paid about $20 and was able to go fishing whenever I wanted all summer. It is hard not to watch the birds at my house. I have seen orioles, blue jays, cardinals, robins, hummingbirds, geese, and even bald eagles. I put out bird feeders to attract birds near my house for easy observation. Even if you don’t put out bird feeders, you can probably find interesting birds to watch and enjoy. Binoculars are useful to be able to observe birds high in trees or too far away to see easily. While you don't want to use food as a coping tool, lots of the activities around food prep are satisfying and relaxing. You get to enjoy planning your garden, watching it grow, and then harvest lots of free vegetables. Gardening can be very inexpensive if you start your own seeds and make your own compost to use for fertilizer. Even if you don’t have a yard, you can grow vegetables in pots on a patio or deck. If you don’t want to rototill a traditional garden, you can grow vegetables in straw bales or build raised beds for easy access. Cooking is a great pastime since it reduces the probability that you will spend money on expensive restaurant food. Watch some cooking shows or videos to learn cooking techniques and get ideas for recipes you want to try out. You can get started cooking with only a few pans and utensils. If you have a successful garden, you’ll need to do something with all of those vegetables. The first thing I remember canning was salsa we made with tomatoes, onions, peppers, and cilantro we grew in the garden. It was messy and a lot of work, but it was fun to make those cans of salsa to save for winter and to give to friends. If you have a freezer, you can use an inexpensive vacuum sealer to pull the air out of plastic bags and seal up your produce to freeze without getting freezer burned. You can start grilling with a $20 charcoal grill. If $20 is too much for you, you can even make a grill for free! My kids build a kebab pit for free using concrete blocks they found and it works great. I also have a gas grill which is more expensive, but very convenient. Grilling outside is one of my favorite activities, followed closely by eating the food that I grill. Nothing is as satisfying as zoning out while making something. The doing is its own reward — but you'll also be rewarded with some of your own handiwork. One of my favorite pastimes is working in my wood shop. I like to repair things, build small projects, and just spend time in my shop organizing my tools and thinking. A wood shop does not need to be expensive. I built one of my workbenches from a kit and others using recycled kitchen cabinets and countertops. Many of my tools were used tools that people gave me. You can take surprisingly good photos with a cellphone or cheap digital camera, especially in outdoor lighting. A quality digital SLR camera with a zoom lens runs around $300 and will allow you to take your photography to the next level, providing more control over the camera settings. You can pick up cheap used musical instruments on Craigslist or at consignment or pawnshops. Of course, buying the instrument is the easy part — learning to play it well takes work and practice. With a sewing machine, fabric, and a pattern, you can make your own clothes. Collecting bargain fabrics is part of the fun of sewing. It's a fact of life that other people can be the cause of so much stress. It's also a fact of life that other people are often the cure. There are lots of opportunities available to volunteer some of your time working for a good cause. Volunteering can be a good way to do something you enjoy and meet other people with similar interests. Some ideas for volunteering: animal shelter, food pantry, political campaign, church organizations. If you get bored hanging around your own house, try going to someone else's house! Visiting friends or family is a cheap way to get out of the house and do something different for a change of pace. Having people come over to visit at your place can inspire you to get cleaning and projects done. Playing cards is a classic cheap pastime, as long as you aren’t placing bets. Poker, bridge, and euchre are some popular card games that allow you to play competitively with others. Finally, it's okay to be a couch potato from time to time. Some people spend a lot as sports fans, paying big money for tickets to games and buying team jerseys and other paraphernalia. But being a sports fan doesn’t have to be expensive. I don’t subscribe to any TV service, but I can find many of my Iowa Hawkeye football games for free, either on over-the-air TV or on radio broadcasts. Sometimes I can find a free video stream of the game on the Internet. I listen to National Public Radio (NPR) for about an hour every day to keep up on news and world events. When I miss my chance to listen to the news for some reason, I feel out of touch and usually end up going on the Internet to check news stories I am following. Keeping up with the news is a cheap pastime and makes it easy to have an intelligent conversation with anyone you meet. What are your favorite cheap pastimes?